One of the many festivities throughout the year in Thailand, Loy Krathong, usually falls in November, but to be precise on the full moon of the 12th Lunar calendar month. In 2014 it will be on the 7th of November . It doesn’t have the manic party insanity of Songkran, but none the less the celebration of Loy Krathong will see Thai people in droves out at their local waterway, lake or pond. It is a traditional ceremony with the releasing of water craft said to symbolise letting go of negativity, bad feelings or bad luck from the previous year. 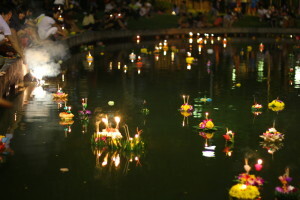 Krathong or the floating basket used in the festival can easily be purchased reasonably on the day. Please consider the environment, though, and opt for one of the baskets woven from leaves or made from the stalk of a banana tree over the ones made from Styrofoam. These things hang around for ages and tax an already burdened environment. The basket should have a candle which is lit just before the basket is launched. Many people also put a coin offering inside the basket, this is for the river or water spirits. Offerings and garnering merit are hugely important to the Thai people and at the end of the day, it’s not a bad practise. Anyway, wherever you happen to be if you have any doubt about where the festivities are, just ask a Thai person! In Bangkok the most popular place is, of course, along the Chao Praya River. If you’re smart and getting around by public transport, then the place to head for is the BTS station at Saphan Taksin. That means if you’re staying on an MRT line, head to Siam and change onto the BTS system. Either way for my money trains are the only way to get around in Bangkok! Once at Saphan Taksin, follow the crowd! The river is very close by, but it may take a bit of time to get through the crowd. I was here in 2013 and it really was a great atmosphere. 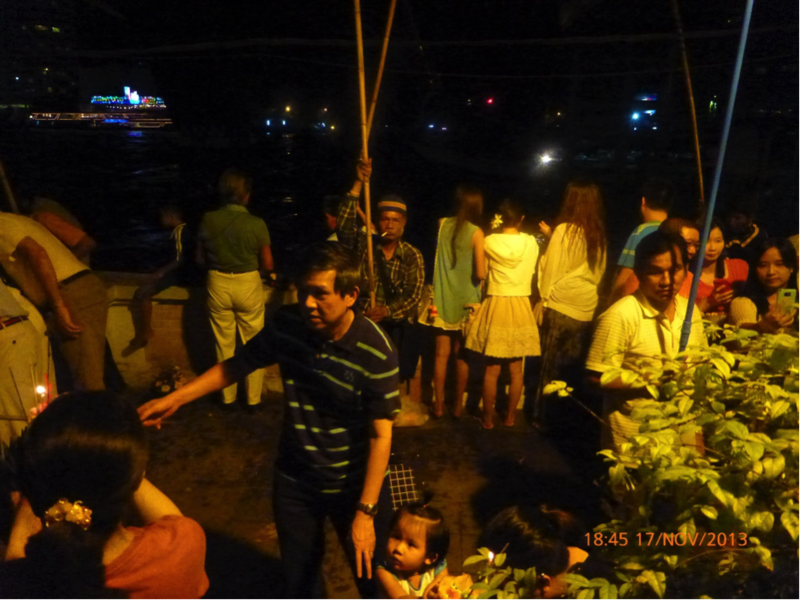 For my money, though, the big drawback with the Chao Praya is you don’t actually get to put your Krathong in the river yourself, but rather you pay someone with a wire basket on a long pole to lower it into the river for you. Depending on the skill of the person with the pole, there’s certainly a disaster factor inherent in this method. 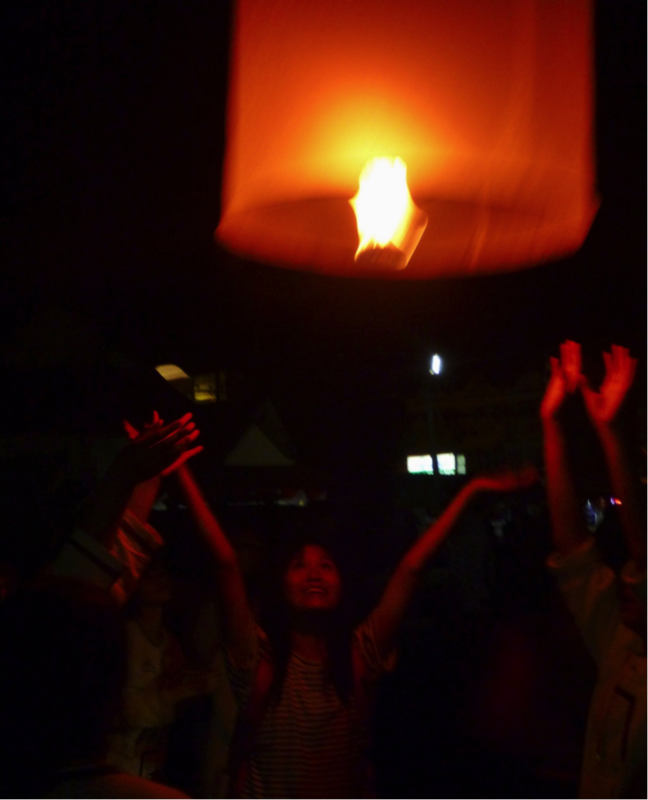 Especially if you’ve opted for a big heavy Krathong! 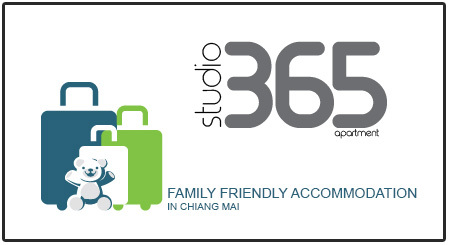 In Chiang Mai you won’t have too much trouble finding a place to celebrate, either. You have either the Mae Ping or the canal, so just take your pick! 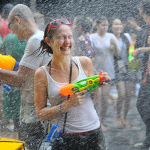 The really great advantage that Chiang Mai offers over Bangkok, however, is that the sister festival of Yi Peng is widely celebrated throughout the north of Thailand and nowhere more so than in Chiang Mai. This involves the releasing of the sky lanterns en masse, which is such a beautiful thing, both visually and experientially, to be part of.